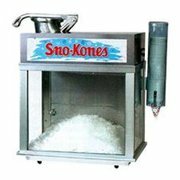 Description: This Commercial Sno Kones machine can shave 500 lbs of ice an hour! Great for fundraisers, big events, school event, or your child's birthday party. Make 2-flavor Sno Kones by pouring different flavor syrup on each half of the Sno Kones. We offer litters or gallons of syrup, or you can pick up your own.